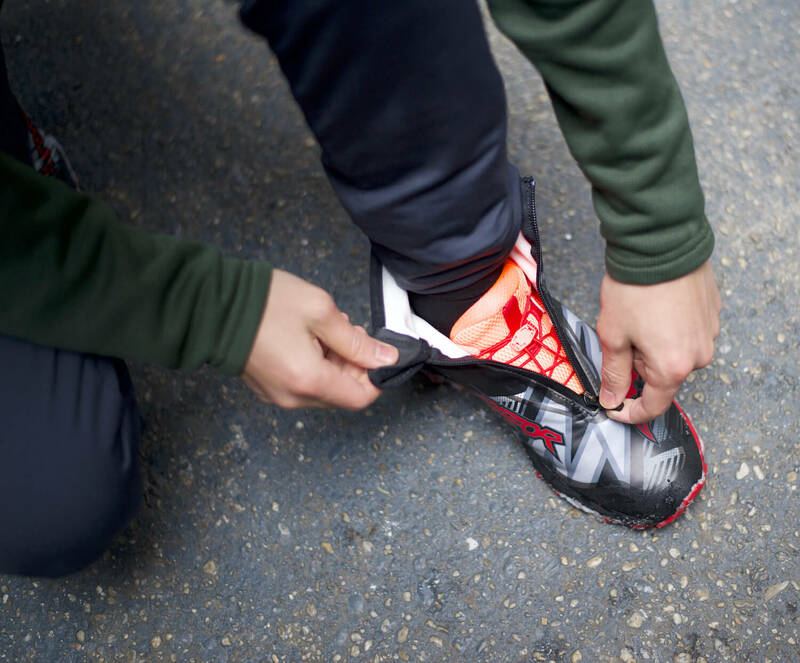 Stay warm and (almost) slip-free when running this winter. As the sidewalks get icy, Saucony’s Razor Ice+ winter running shoes are an option for the hardest core runners, unnerved by the cold. 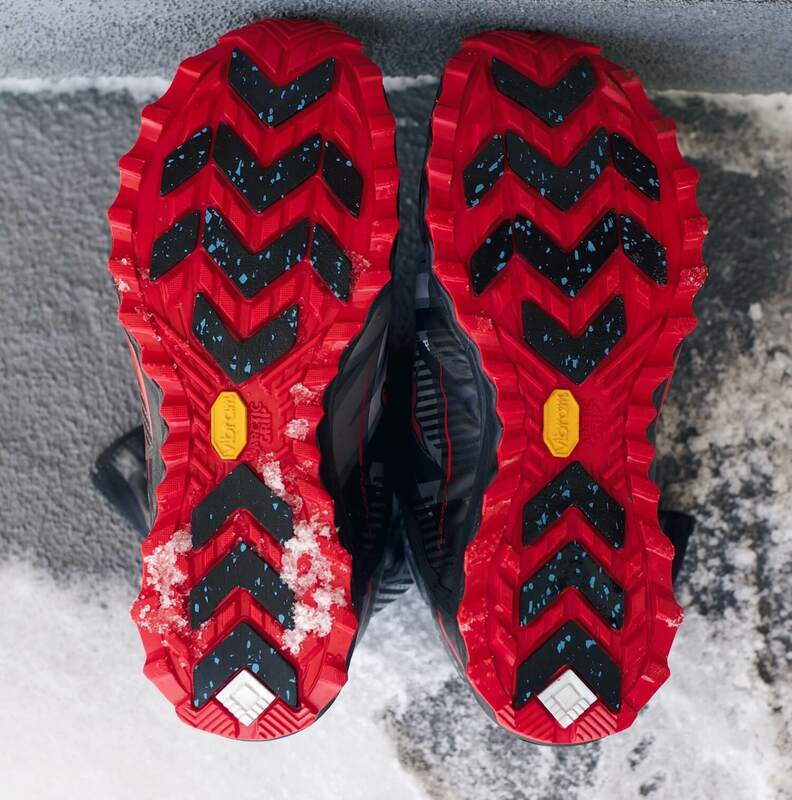 This shoe is one of the first products to implement Vibram’s vaunted Arctic Grip sole technology, which is said to and has been shown to be markedly better at gripping wet ice than normal soles. I’ve had the chance to test these shoes, wearing them for runs in New York City, to the gym and also casually. There are two parts to the Razor Ice+: (1) the inner part, which is bright orange and (2) the outer FLEXFILM membrane, which zips up to cover the inner. The shoe’s membrane is soft and made of neoprene. Along the ankle, the left shoe bears the word “saucony” and the right the word “razor”. Could they tone down the aggressive branding? Maybe. But it gives off a race car vibe, embodying speed and sleekness. The Razor Ice+ for men only comes in one color option. I’d love to see other colorways; possibly one with less branding, like Salomon’s S-Lab XA Alpine. The orange inner part feels like any other running shoe. In fact, if I were to cut off the membrane, the Razor Ice+ would essentially become a normal running shoe. 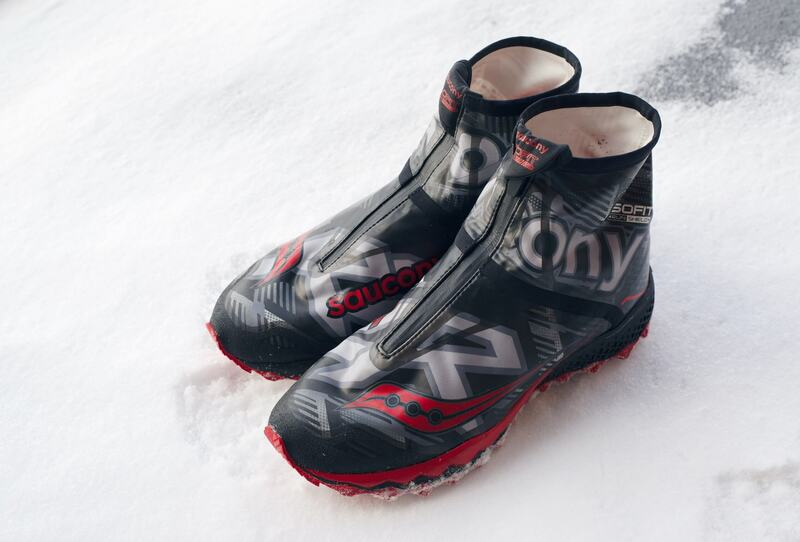 When running, the Razor Ice+ feel a lot like the Saucony Kinvara, which I own and wear during the other seasons. Both shoes have the same 4mm offset and have a lightweight, lightly cushioned feel which Saucony describes as “responsive”. Not waterproof. With the wind resistant FLEXFILM outer layer already in place, why go all the way and make it with Gore-Tex or any other waterproof material? (Minor potential improvement) An asymmetrical zip (like the La Sportiva Crossover) rather than the current zipper that goes straight up the middle of the foot would probably work better anatomically. With a retail cost of $180, the Razor isn’t cheap. It’s very much a niche shoe, only useful in snowy, icy situations, but it’s definitely worth it if you are a keen winter runner. 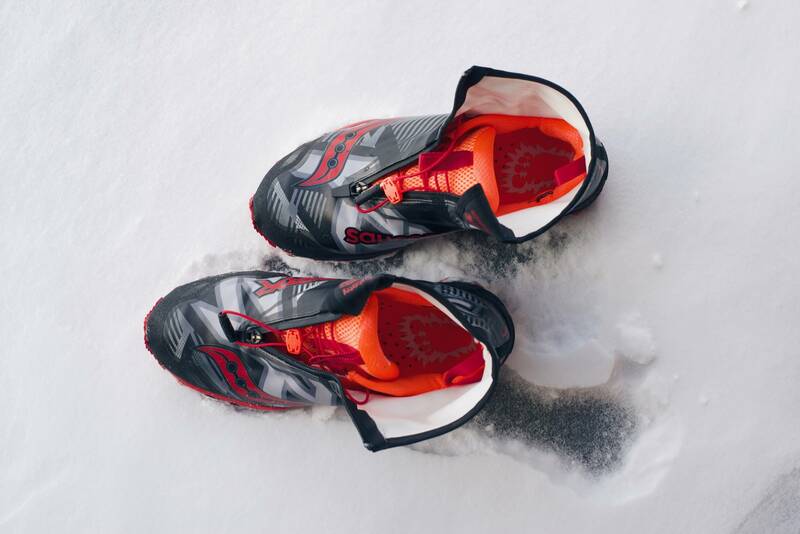 An alternative to getting a completely new pair of running shoes for the winter, would be getting a pair of ankle high gaiters and a pair of YakTrax Run traction add-ons to winterize your current shoes. It’s a makeshift solution, but it does work. In the end, it does not save you much money, and it doesn’t address the issue of wet snow getting into your shoes. I’m a size 9 in the Saucony Kinvara, and a size 9 in most other shoe brands. As an owner of other well fitting Saucony shoes in size 9, I was slightly surprised to find the size 9 Razor running shoes to be on the snug side. The Razors run a bit small – you might want to go up half a size. I ended up sticking with my snug size 9 shoes. It wasn’t uncomfortable, so I stuck with it. If you’re unsure about sizing, I recommend buying the Razor Ice+ in person, or from retailers like Zappos which offer free returns. The black chevrons on the sole employ Vibram’s Arctic Grip material. In warmer weather, when there isn’t any snow or ice outside, the soles act and feel like that of any other running shoe. That’s the main benefit of Arctic Grip over spikes. And you won’t damage any surfaces. The Arctic Grip material has a rough, hard rubber feel. Personally when wearing Saucony’s Razor Ice+ shoes, I’ve felt a slight difference in grip. Compared to my normal running shoes, I have a bit more traction on ice. Don’t buy these shoes and expect a miracle. Arctic Grip is not an elaborate marketing gimmick but neither is it magic – you can definitely still slip on ice with Arctic Grip. Take a look at a few Youtube videos of Arctic Grip in action. Most demos tend to involve just ice, which doesn’t reflect real life situations unless you’re running on a ice skating rink. When running in the winter, there’s ice, concrete and snow. From my experience, snow has stuck to my soles, making grooves and the grip ineffective. Like with all sole materials, over time, the Arctic Grip will wear down. Conditions in New York City haven’t been cold or icy long enough for me to have tested the grip conclusively, but I’ll update this review once I get more wear out of the shoes. 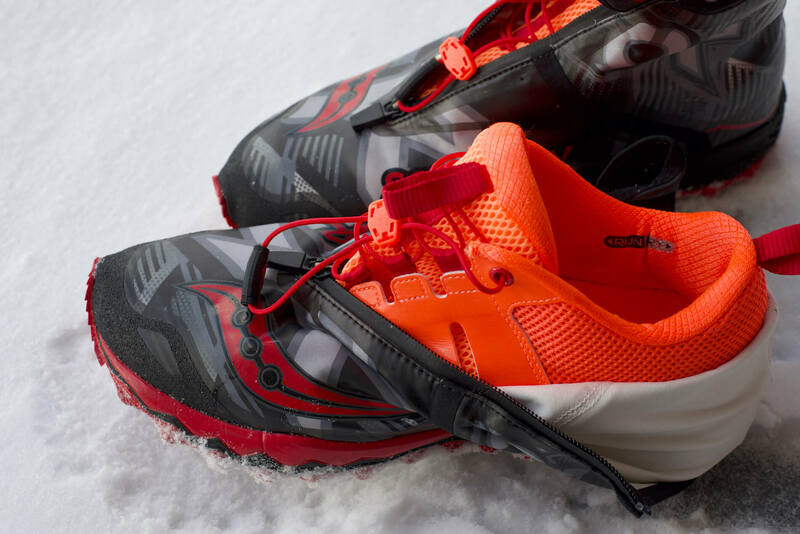 If you’re a frequent winter runner, the Saucony Razor Ice+ shoes are a must have. Vibram’s Arctic Grip technology won’t elevate you from klutz to god, but it will make running on icy surfaces a bit steadier. What are your thoughts? Leave comment below. 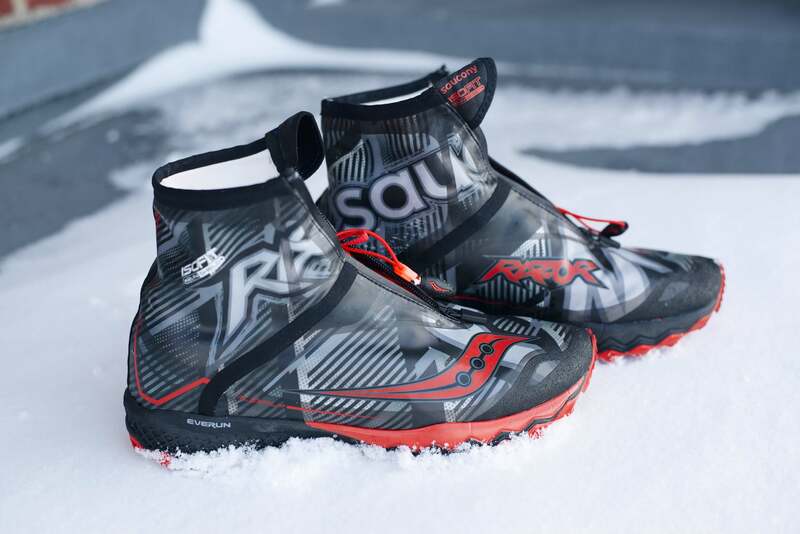 The Saucony Razor Ice+ winter running shoes were provided for this review. As always, this Saucony Razor Ice review contains only my honest views and opinions. I wore the Razor ice+ today, it was -21C and ankle deep snow. My feet stayed warm and dry with no snow inside the shoe. The snow covers are awesome, compared with any other shoe that I have for winter. The zipper is aligned top center and rubs a bit but not seriously. Tight stretchy fit keeps out the snow. Grip is acceptable, not as good as my studs (#6 hex head screws ) but still pretty good and no clicking. Shoes are nice light weight and fairly low drop . In summer I like a zero drop shoe, but these are fine on snow or ice. Snow covers are a five. Grip on loose snow, a three, grip on hard pack snow, a four. Fit was a bit small but comfortable. You have to pull them on with the tabs, but good once on. Havn’t tried them on wet ice yet , been too cold …. May still add studs for wet slippery/slush days. Hey Mike – that’s awesome, thanks for sharing!